Many of you know that we have a Positive Discipline Social Network where members encourage and support each other in the practical application of Positive Discipline. Recently someone posted a discussion about a friend who is feeling discouraged about a son who keeps getting into trouble at a school that uses the colored card system. Every time he “misbehaves,” he gets a colored card and his parents are expected to punish him at home. I had to respond to this discussion because I have a close friend who is going through the same thing. Of course you might guess my opinion of the color cards—a very dysfunctional system. Then teachers encourage parents to be dysfunctional at home—adding more punishment. Before I continue, I will say that there are many good things at my friend’s child’s school—including the teacher. The school and this teacher simply believe in Behaviorism—that punishment and rewards are the best way to motivate “good” behavior—very different from the Adlerian Psychology base of Positive Discipline. So, I will share with you the advice I have given to my friend. Don't add punishment at home. Keep encouraging him to focus on solutions. My friends concern was that his solution was to be sent to his room for 5 minutes and she didn't think that was severe enough. At this point I have to digress and editorialize. It is so interesting to me that parents and teachers are willing to keep doing a punishment over and over, even if it doesn't work, but stop doing a Positive Discipline tool after one or two tries because it doesn't seem to work--right away. I told my friend to take his suggestion and send him to his room for 5 minutes (very different from punishment when it is his idea). When he comes out avoid discouraging lectures. Use encouragement. Just say, "I hope this works." If it doesn't work—which it won't because he is only a kindergartner and gets colored cards for things like talking (socializing with his friends)—which is developmentally appropriate for a Kindergarten child to do. (Arrrgggghhh!). Celebrate every time he gets a colored card. This provides another opportunity for him to practice working on solutions. Every time he does, be encouraging and simply say, "Cool. I hope this works." No reprimands when it doesn't—just anther opportunity to practice problem solving—over and over and over. Now lets time travel five years from now. Make some guesses about what a child might be thinking, feeling, and deciding about himself after many opportunities and encouragement to experiment with solutions when he gets into trouble. Then make some guesses about what that same child might be thinking, feeling, and deciding after experiencing punishment at school and at home every time he gets into trouble. It is very important to consider the long-term results of what we do. Lately I have been using the analogy of what it takes for a child to learn to talk—years of example—first to say a word, then more listening to examples and encouragement to learn sentences, and more years to keep developing and perfecting language. Why do we expect immediate results for other kinds of learning. Why do we expect social (behavior) learning to be immediate? And, how well would children learn to talk if they were humiliated and punished every time they got it wrong. Children learn what they live. If we want our children to grow up learning to be kind and firm and respectful, we better make sure that is what they live. Remember that encouragement is the foundation of Positive Discipline. 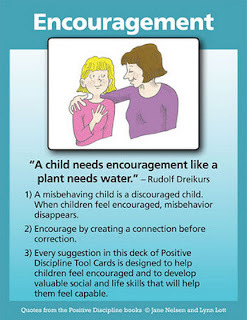 As Rudolf Dreikurs said, over and over, "A child needs encouragement like a plant needs water. It is essential to healthy growth and development. Listen to the excerpt below which beautiful illustrates how encouragement can work much better than punishment. The following is an excerpt from the Building Self-Esteem Through Positive Discipline MP3. Thank you Jane for another great article! I am really excited about this series. Thanks for coming up with this fun way to continue practicing the parenting tools. I have a blog, http://positivelymontessori.blogspot.com/, and I am following along with the tool card each week. I have been linking back to your and Mary's blogs for more information on the tool of the week! Thanks Amy, I enjoyed reading your blog. It is encouraging to read more examples. With your help, we will influence many parents to treat children more respectfully. well said. i like your line: "If we want our children to grow up learning to be kind and firm and respectful, we better make sure that is what they live." couldn't agree more.